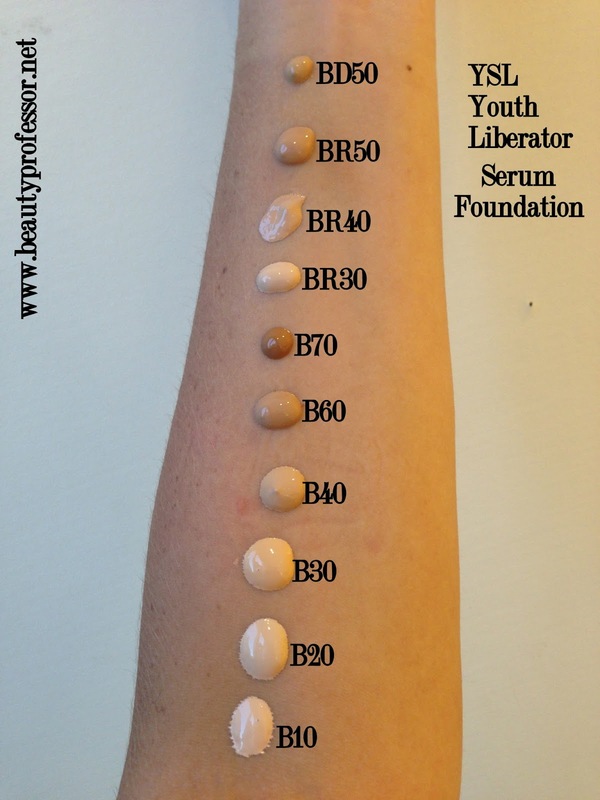 Beauty Professor: YSL Youth Liberator Serum Foundation...Swatches of Every Shade! YSL Youth Liberator Serum Foundation...Swatches of Every Shade! Above: The YSL Youth Liberator Serum Foundation is housed in a lovely ombre bottle...so chic! During the Neiman Marcus Fall 2013 Trend Event last week (full recap soon! 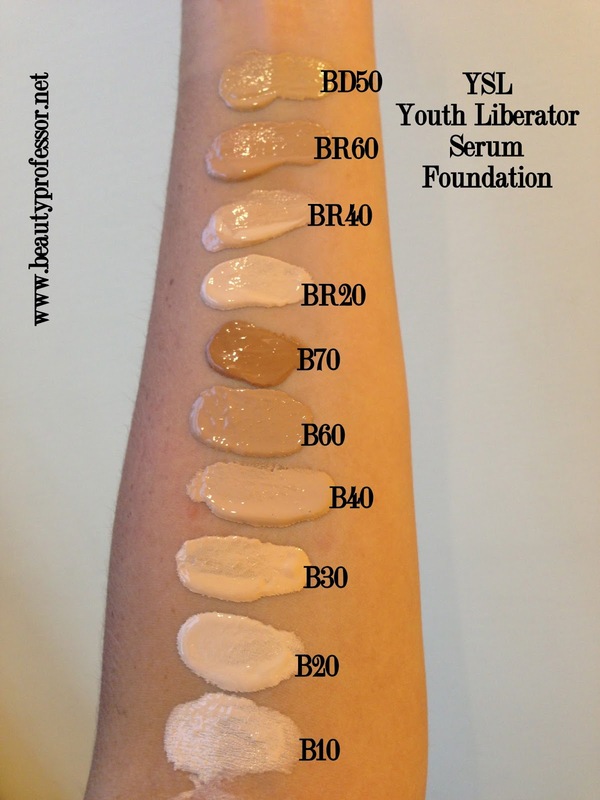 ), I was delighted to discover that the YSL Youth Liberator Serum Foundation testers had just arrived, enabling me to swatch all 10 color offerings! Although I left with samples of three shades (B30, BR40 and BD50), I haven't experimented with the foundation long enough to offer a cogent assessment. However, I am happy to share my swatches and hope they are helpful to those striving to find a perfect match in this brand new formula. The shades are separated into three categories: B (for skin with neutral to warm/yellow undertones), BR (for skin with neutral to cool/rosy undertones) and BD (for skin with olive/golden undertones). I would like to note, however, that I found the BR shades were not inordinately rosy/pink...two of the three (BR20 and BR40) are actually are a very nice neutral beige. In fact, I think I preferred the BR40 as my closest shade match (over the B30, which looked a little flat on my face and oxidized a tad orangy on my wrist and BD50, which was a bit too dark for my NC25 skin). 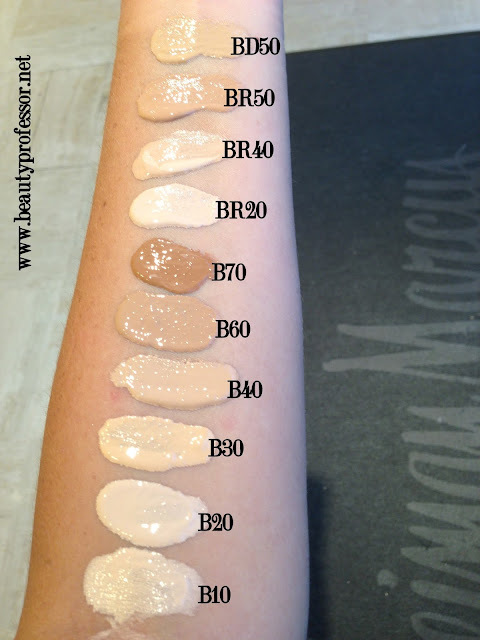 It is also imperative to mention that the currently available shade range favors light and medium skin tones with only B60, BR60 and B70 at the darker (though not particularly dark) end of the range. If this foundation is as good as its description makes it sound, then I hope they introduce darker shades to the spectrum so everyone can enjoy it! This formula is currently available at Neiman Marcus, Nordstrom, Barney's NY, Bloomingdale's, Saks and Lord & Taylor. Above: Dots of the YSL Youth Liberator Serum Foundation before blending out in semi-outdoor lighting. Above: Swatches in as natural daylight as I could get at 6:30 PM...please note that BR60 is labeled incorrectly and should be BR50 like it is in all other swatch images. Above: Swatches in semi-outdoor lighting. 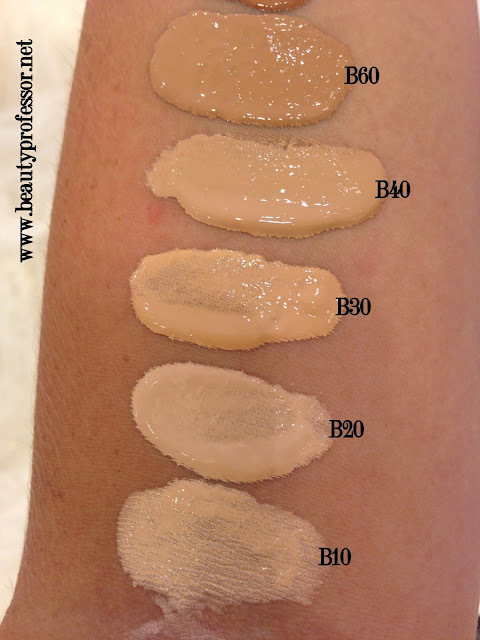 Above: Close up swatches of the "B Range" in indoor lighting. Above: Close up swatches of the darkest B shade as well as shades in the BR and BD range in indoor lighting. Above and below: A mixture of equal parts B30, BR40 with a touch of BD50 on my face, in direct sunlight. The formula does seem to create a seamless, skin-like finish. Bottom Line: The YSL Youth Liberator Serum Foundation (which retails for $69) is sold at YSL counters everywhere, including Neiman Marcus, Nordstrom, Barney's NY, Bloomingdale's, Saks and Lord & Taylor....I haven't yet seen it on the Sephora website, but I am guessing it will be making an appearance there soon. My first impressions of this formula are as follows: It has a silky texture, offers buildable medium coverage, has a hydrating and dewy finish, wears comfortably, is lightly scented (typical YSL base product scent) and, when applied with a Beauty Blender, seamlessly blends in, becoming one with the skin. During my initial trial, I didn't set it with powder to get the most accurate sense of its lasting power and found that it didn't start getting overtly glowy (thereby requiring a touch up) until my 6th or 7th hour of wear. Additionally, the inclusion of the YSL Youth Liberator Serum within the foundation (for brighter, plumper skin) and SPF 20 protection make this a formula with noteworthy skincare benefits. Although I enjoyed my first experience with it, I will withhold official judgement until I've used it a few more times. 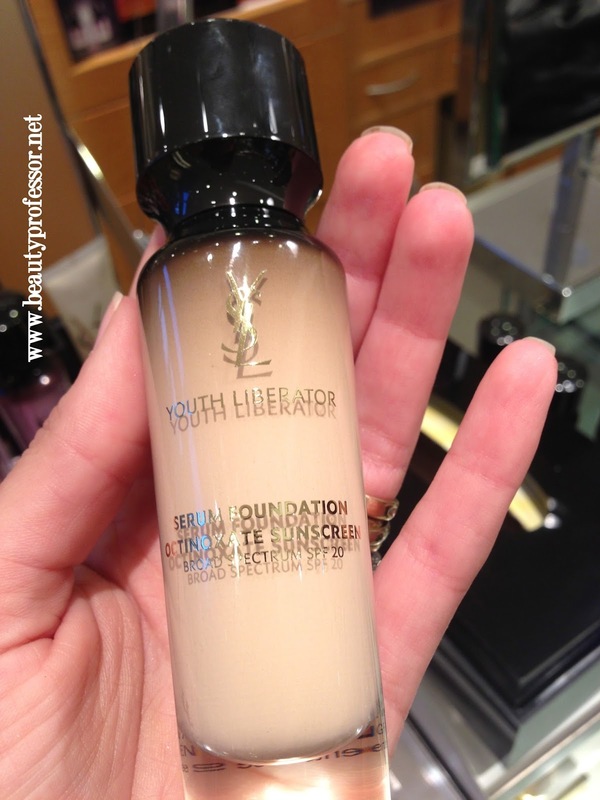 Have YOU tried the YSL Youth Liberator Serum Foundation? Thoughts? * This post contains affiliate links; my disclosure policy contains additional details on how these work. Thanks so much! Yes, this finish is totally up your alley ; ) I appreciate your kind words about my swatches...I take them seriously and it's always encouraging to hear that they are helpful! I am honored to be your beauty blog of choice. So glad that the Napoleon BBB cream is on its way...can't wait to hear your thoughts. It is such a silky and radiant formula! I noticed in your next comment (it's been a busy couple of days!) that you got (and love!) the Les Beiges powder...fantastic! Thanks for the pics... I too am always looking for a new foundation. So far out of all of your foundations which is your favorite and why? I would love to find a no-transfer foundation that looks great. My usual problem is the color ranges.. always the lightest yellow color. My pleasure! This summer, my favorite foundation overall has been the Kanebo Sensai Cellular Performance Foundation...perfect coverage, finish and shade match. If the no-transfer quality is on the top of your list, then I highly recommend the Hourglass Immaculate Foundation (I have all shades swatched on my blog)...beautiful lasting matte finish and this formula easily ranks in my top 3 or 4 overall! You would likely be the shade Porcelain! Thank you ever so much for the update...I am thrilled that you were able to track down the Les Beiges (my local Macy's is often a forgotten gem as well when I am searching for a difficult to locate product from a mainstream line like Chanel!). I am so happy that you love #20...it is such a special powder for mattifying without looking chalky!! I suggest #40 or even #50 for sculpting; undertone-wise, those two are better than #30 (which is a little pinky red) in my opinion. Thanks so much your introductory thoughts on this new foundation! I am really interested to hear your opinion on it's performance and to hear how it compares to other foundations in your regular rotation. I must also note that I appreciated you swatching dots of the product in addition to swipes, as this helps with shade selection. I have being loving the Kenebo Sensai Cellular foundation which provides a lovely glow to the complexion without being too oily or shiny- thank you for the recommendation! B.P I am currently looking for an under eye concealer with a very moisturizing formula as unfortunately I have always battled with really fine lines under my eyes (I am 32), and EVERY concealer I've tried seems to cling to that area. I would really appreciate any assistance you could provide in the way of useful tips, recommendations or thoughts on an appropriate product? So happy that you enjoyed this post...since I've only tried it a couple of times, I wanted to be abundantly clear that I wasn't ready to give an official verdict, although I also wanted to share the swatches with those looking for their match in this formula ; ) Thanks for weighing in on the "dots"--it was my mom's idea and I am glad that they are helpful! The Kanebo Sensai Cellular foundation is just so wonderful (pleased you love it, too); even though I am initially impressed with this new YSL formula, it will take a minor miracle to make me stray from the Kanebo for any long period of time! I have three concealers to recommend for your purposes...I always like to apply them with my pinky (rather than a brush) and gently pat it into the orbital area until it is fully absorbed into the skin! 1. Le Metier de Beaute Peau Vierge Concealer in #2...this is a treatment concealer (it has anti-aging properties) that flawlessly perfects the under eye area and avoids from caking for the whole day. I forewarn you, it is expensive...I think around $90 but the stick lasts forever. 2. Giorgio Armani Maestro Eraser Concealer in #4...also a treatment concealer, it comes in a tube and is more liquid in texture...studies show it actually helps to fade dark circles with prolonged use. It doesn't cake and looks luminous! I think this is around $40. **I have swatches of concealer options #1 and #2 on my blog! 3. Rouge Bunny Rouge Fine Spun Light in Orionis...this has the least coverage but most light-reflecting properties. It comes in a "click pen" type dispenser and just brightens up the eye area and makes it radiant and hydrated. I think this is around $40 as well. I hope that helps...take care and keep me posted! Thank you so much dear B.P, I will look into the Le Metier de Beaute and Maestro versions soon, and will let you know how I go. Also, do you recommend powdering the under eye area in order to set it? I have being using the Laura Mercier secret brightening powder but I am not sure whether it's adding to the creasing. So very happy to offer my suggestions! I can't wait to hear your thoughts on the LMdB and Maestro concealers...I am sure that you cannot go wrong with either option! Depending on the humidity, I sometimes use a setting powder for the under eye area...this helps to seal in the concealer but also keeps my eyeliner/mascara from migrating! The one that I prefer is the LMdB Eye Brightening and Setting Powder (I use Refresh)...it's tiny, but lasts forever! So glad you're still loving the Les Beiges! It is always exhilarating to discover a product that is perfectly compatible with your skin! Thanks for the details regarding the Josie Maran blush...I've been hearing good stuff about it for weeks and just may have to take a peek at it sometime this weekend. I have majorly long days ahead and always love a long lasting product! How wonderful to hear from you...I hope all is well in your life. Thanks for your kind compliment! I appreciate your update regarding your foundation journey ; ) The Kanebo Triple Touch has a lovely, creamy concealer and the powder is very luminous (a bit more so than the Chanel Les Beiges). It is also less expensive than the Sisley! I like having the Triple Touch for days when I just want to carry a minimum of makeup since you get three products in one. I am so happy that you've been working with Kimmy...she is a gem! Hey there!! I'm sure you knew I'd have to get my paws on this foundation! LoL! There isn't a YSL counter within 150 miles of me so another blind buy it shall be. The Kanebo Sensai CPCF is AMAZING, but I like to have a few jewels in the rotation...I know you know what I mean ;). CF-22 Natural beige in CPCF is the most perfect shade match I have ever had...ever! Do you think BR40 would be a good place to start with the YSL Youth Liberator? In Teint Touche Eclat, b30 was too peachy and looked orange-y once dry...but b40 looked really nice. I ended up not purchasing TTE, as the coverage was just too sheer. Youth Liberator just sounds too perfect...I at least want to give it a try! :D. Thank you so much for all you do...you are one of my most trusted sources for reviews and for your all around love and knowledge of the beauty world! I know it was a while ago, but I hope you had an amazing road trip filled with lots of memories!! Again, thank you from the bottom of my heart for the Kanebo help in finding a shade and also for rec'ing Kimmy! You're the best! Good to hear from you. I am thrilled that you are still loving the Kanebo Sensai foundation (and Kimmy!!) and completely understand the need to have a few divine foundations in one's rotation ; ) To be honest, the shades for this particular formula are a little tricky, especially if you are a perfect match for the KS CP Natural Beige (as I am as well). I am guessing that you could get away with B40 or even BR 40! Another foundation that I am loving right now is from a line called Ardency Inn (a new line at Sephora). Light-Medium Olive is another good match for the KS Natural Beige and the coverage on this formula is amazing...full review soon! Hi gorgeous! I'm staring at your swatches (thank you so much for them!) I'm wondering something--the tone between B30 and B40 is striking. B30 is so very very yellow, and B40 is more peachy/neutral I think. It's hard for me to judge whether one is darker than the other, with the color shift between them so drastic. Is it possible that they are the same depth, just different tones? Sorry, I really should get to a counter instead of hounding you like this. I tried a sample of B30 and it was sooooo yellow, I'm wondering if B40 will do (I tried a sample of B20 and it seems too light, and I'm warm toned about MAC NC15/20). Thank you for the sweet comment! Your observations regarding B30 and B40 are quite astute and accurate. Despite their different undertones, I don't think they are the same depth...B40 is a hair darker. A few girls I know who wear approximately the same shade as I do (@NC25) opted for the B40 instead of the 30. I think if I bought a full bottle, I might embrace the BR40 oddly enough...it translates as a neutral beige rather than a pink one and is the best depth for my current skin tone. In my experience, I suggest the BR20 because the B20 is very light (probably lighter than N20) and the BR is definitely not too pink (see my comment above). I didn't realize that I was 'looking' for a new foundation until I read your post! When I was out yesterday, I stopped by the YSL counter at my Nordstrom to get a sample. Your foundation dots, swatches and descriptions were so helpful. I was fairly sure that I'd be BR 20 based on your post. Color was spot on! Tried it today - felt like absolutely nothing on! It is still a bit too hydrating for the hot weather we have right now. However, I think once the weather cools off I think this will be absolutely perfect. I experienced some dryness last winter for the first time ever so I think this will be great. Thanks for the information! Thanks for the wonderful update! I am beyond glad that this post was helpful for you and it makes me happy to know that you found your perfect match and enjoy this formula. I agree...as soon as fall brings cooler and dryer weather, this foundation will be fabulous! I'm new to your blog , google brought me here when I was googling for this foundation review! thank you thank you very much for your swatches and the descriptions since I'm going to order the foundation online, so your swatches are really helpful!!! I have one question, since the serum is marketed as anti aging serum, do you think it will work for 'younger' skin? I'm 22 and I am so interested in this foundation, even more after reading your review.. would you still recommend this foundation? thank you BP!! love your blog!! I'm also new to your blog who found her way here through Google while looking for a review on this foundation! And I have to ask, I'm a NW15, which shade would you recommend? Going to look through your archive now for more good stuff to read! Welcome to my blog...so glad you found your way here. In light of your current match, I would suggest checking out B20 or BR20! I've seen a lot of youtubers talk about this recently. As someone who has very oily skin and who dries out just a little come winter and whose current foundations include MUFE Mat Velvet + and Kat Von D's Look It Tattoo foundation, do you think I should check it out? Lately, I've been trying to go more natural just using a tinted moisturizer (Nars) and some powder but it gets glowly a little too quickly for me. In response to your question, this is definitely a glowy foundation so it is going to come down to your personal preference. I find that it provides medium coverage and looks great for a few hours, but it will require some powder touchups as the day wears on, especially if there is humidity in the air. I also want to try this foundation...rite nw im using dior skin forever in shade 023/peach...I have combination skin and plz can u recommend any concealer for dark eye circles,pimples and scars...thankyou!!! I think you would likely be B40 in this foundation...in terms of concealer, I recommend the Laura Mercier Secret Camouflage for pimples and scars and the Giorgio Armani Maestro Eraser Concealer for dark eye circles. Thanks so much this was super helpful! Extra thanks for highlighting the darkest shade, I know its my color now thanks to you. Thanks so much for the nice review. I have bought it (shade BR20 & B20) and literally loved it! It's definitely not for young skins as they will never notice the benefits... I am 40 years old and found it very moisturizing with a wonderful sheer finish but still buildable and even then my skin feels comfortable with it. It's like a luxurious cream, but not greasy (i have a combination skin). I feel like using a great treatment product that benefits my skin. I don't need much coverage anyway so I enjoy the fact that it doesn't have this "mask" finish that will make my wrinkles (even the small ones that I have now) less noticeable! If you are 40+ you will understand what I mean. It's getting difficult to find a nice, moisturizing foundation in that age that sets well (doesn't make you shinny) that will not accentuate your fine lines. :-) Really loved it! It's expensive, but what can you do???? :-) Truly amazing product! Thanks for the swatches--they are really helpful, as usual. So what is your official verdict on this foundation after using it a few times? My pleasure, Kate! I liked it but didn't love it enough to order...the coverage was a bit lacking and the lasting power was less powerful than my favorite Kanebo Sensai CP Cream foundation. I think its one of the best hydrating foundation in 2014. Best for winter actually!